While involuntary euthanasia – the act of ending someone’s life without their consent to spare them pain and suffering – is illegal in the United States, assisted suicide – or voluntary euthanasia – is legal in six U.S. states. In Washington, Oregon, California, Vermont, New Mexico and Montana, doctors may prescribe lethal doses of certain drugs to patients who have made the choice to die, rather than endure further suffering or add to the suffering of their families. 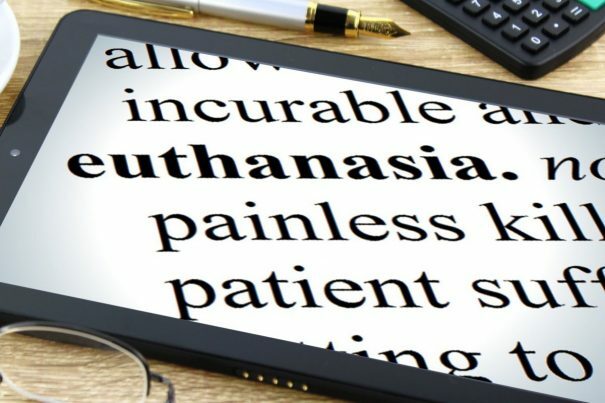 Euthanasia is already a hotly debated subject, and it has become even more controversial since it became evident that health insurance companies are using it as a way to avoid properly caring for terminally ill patients. Dr. Brian Callister, an internal medicine specialist from Nevada, and cancer survivor J.J. Hanson, a 36-year-old former Marine, have teamed up to highlight this issue and to discourage other states from legalizing euthanasia. Hanson, who is president of the Patients’ Rights Action Fund (PRAF), was diagnosed with an incurable brain tumor called glioblastoma back in 2014, and was given less than a year to live. He says that in the immediate aftermath of his diagnosis he was depressed and considered euthanasia, and believes that if it had been legal in the state of New York, where he lived at the time, he would no longer be around to tell his tale. Having made the decision to live, however, he has beaten the odds, and after several surgeries, clinical trials and other treatments, has already lived for two years longer than doctors said he would. Hanson’s experience is in stark contrast to that of Brittany Maynard, who chose to end her life at the age of 29, under Oregon’s Death with Dignity Act, after she, too, received a glioblastoma diagnosis. Hanson and Callister believe that insurance companies with their eye on the bottom line may pressure patients into taking the assisted suicide route simply to save money, rather than being willing to pay for medical treatments that might provide a real chance for these patients to survive. One example of a woman who was pressured in this way is Stephanie Packer, a young mother of four, whom Dr. Callister claims was denied chemotherapy and instead offered an assisted suicide drug which costs $1.20. Packer had no desire to die, and wanted to fight to survive and see her children grow up. These laws are also dangerous because they open the door to involuntary euthanasia. It is now much easier for a healthcare provider to claim that they were asked to provide life-ending drugs, when in fact they might not have been asked to do so. Imagine a world where health insurance companies get to decide what’s “in the patient’s best interest.” Now try to picture them not considering money when they make that decision. Follow more news on deliberate depopulation at Depopulation.news.